President Hugo Chávez of Venezuela has taken steps to pull out of the global forum most used to settle investor disputes, where Caracas faces more than $40 billion in claims for nationalized properties. 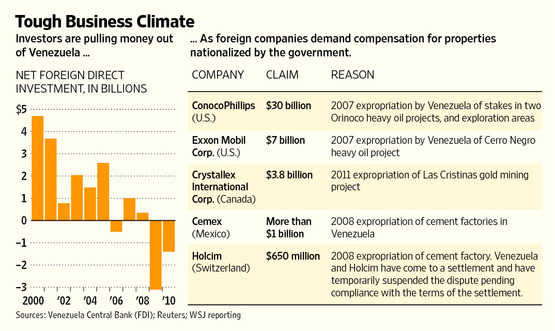 Documents show that Mr. Chávez, shown in August, is moving to avoid financial sanctions from abroad. Venezuelan officials have drawn up plans, at Mr. Chávez’s order, to withdraw from the International Centre for the Settlement of Investment Disputes, or ICSID, a unit of the World Bank in Washington, according to recent documents reviewed by The Wall Street Journal. Venezuela’s withdrawal from the ICSID also would fit well the nationalistic bent that has led Mr. Chávez to expropriate 988 companies, 401 so far this year, according to Conindustria, a Venezuela industry chamber. In other Latin American news, Mario Blejer, a former Bank of England adviser who took the reins of Argentina’s central bank after its 2001 default on $95 billion, is telling Greece to ‘Default Big’ to Address its Debt Crisis. Well, at least he didn’t advise them to plunder private pensions.